Everyone knows the signature sound of a roaring gas chainsaw. Sure, they have a lot of power and torque to cut through large trees all day long. But gas-powered chainsaws are not for everyone. What to do if you’ve got a few tree branches to cut up or just want to trim the base of the Christmas tree? Best Electric chainsaws used to have the reputation for being weak and ineffective. But not today! If you need the occasional utility of a chainsaw but don’t want a roaring engine, a heavy saw or having to blend fuel and oil…then an electric chain saw is right for you. Read on as we rate the best of this year’s electric chainsaws. Detailed review of top rated electric chainsaws. Weighing in at only 10 pounds, the Sun Joe 12-inch chainsaw is lightweight, low cost, and easy to handle. This is a good inexpensive electric chainsaw for light yard work. If you have small trimming job, this one is for you! If you plan on cutting larger limbs or firewood, consider the other more powerful models. This model comes with a two-year warranty. 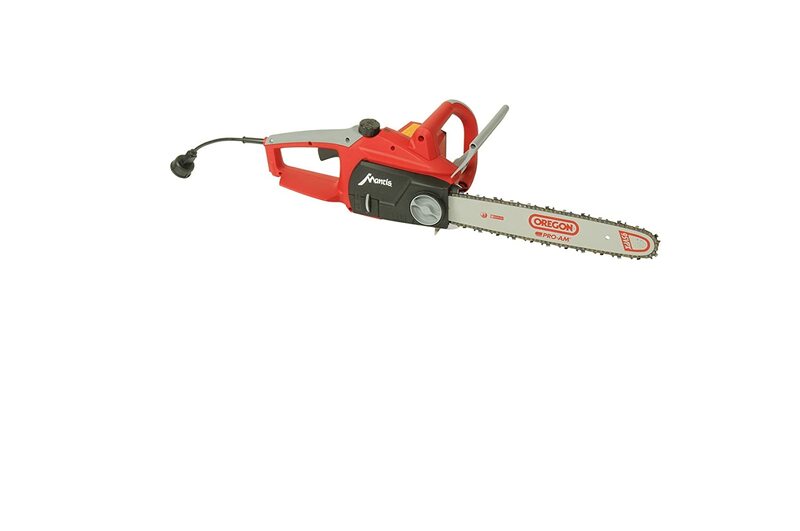 This WORKS 16-inch best electric chainsaw is an exceptional value and all-around favorite with homeowners. An automatic chain brake adds increased safety and peace of mind. The automatic oiler keeps the chain cool and cutting smoothly. The tool-less chain tightening system keeps the chain at the right tension. No manual adjustments needed. This is a good general-purpose best electric chainsaw for most yard projects. The Oregon SC1500 offers plenty of trimming power and safety. A hand-guard and automatic chain brake makes wood-cutting safer. The ergonomic molded handles coupled with a balanced weight design reduce fatigue and strain. The powerful 15 amp motor, coupled with an 18-inch bar makes this a powerful wood-cutting tool. This self-oiling electric chainsaw also has an automatic chain sharpener to keep you cutting through wood like butter and hence its in our list of best electric chainsaws. Comes with a 2-year consumer warranty. Looking for a heavy-duty, professional-grade electric chainsaw? Look no further than this Makita powerhouse. The large trigger and padded grip work great when wearing work gloves. The oil reservoir has a window so you can easily check the chain oil level without opening the fill cap. The tool-less chain tightening system reduces maintenance. The soft-start motor lets you slowly increase the cutting speed. The motor also has a sensor that will prevent motor burn-out in case the chain gets pinched in a log. 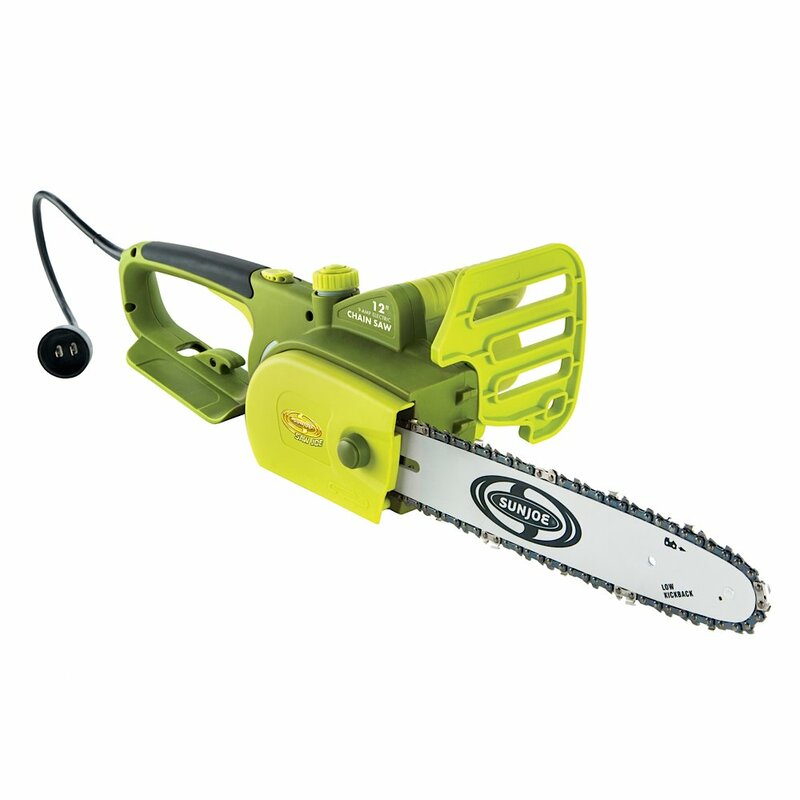 Comes with a 1-year warranty and hence its one of the best electric chainsaws in our list. The Mantis 8530 is the only German-made electric chainsaw in the buying guide. It features German quality and craftsmanship in a lightweight package. It is extremely quiet yet powerful. Precision 16-inch bar and blades make light work out of fallen limbs and firewood. Nylon-coated aluminum gears insure long life and smooth operation. The automatic chain brake, chain lubrication system and chain tightening features round out this complete chainsaw package. The helpful manual illustrates how to safely trim and cut branches and logs. The two-year warranty is serviced in Pennsylvania, USA. 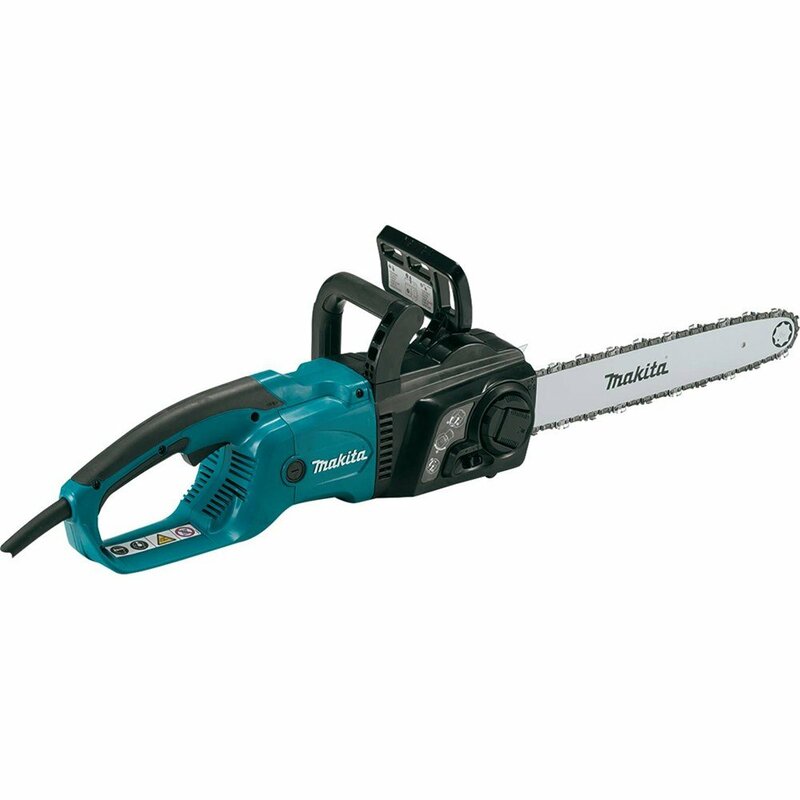 Traditional gasoline chainsaws are powered noisy by two-stroke engines. Two-stroke engines are used because make a lot of torque, which means they won’t bog down under a heavy load. Two-stroke engines burn a special mixture of gasoline and oil. You have to blend this mixture and keep a jug of it ready anytime you want to use the saw. Gasoline-powered chainsaws are built to cut through thick timber all day long. The other benefit is that they are portable and can be taken anywhere, like the forest or even by a fireman to cut through a roof. On the downside, internal combustion engines are made of metal and are heavy. They can be finicky and not start if you don’t maintain them properly. But for the homeowner who occasionally just needs to trim a branch, the simplicity of an electric chainsaw is the way to go. Some may question the ability of an electric chainsaw to cut through a log without bogging down or over-heating. This is a legitimate question. Fortunately there have been many advancements in electric motor technology that have made their way into electric chainsaws. The development of computer-controlled brushless motors means more torque and power is available from a smaller, lighter and quieter motor. If you think these features sound perfect for an electric chainsaw you are correct! Modern brushless electric motors run cooler, quieter and have less vibration compared to early electric chainsaws. 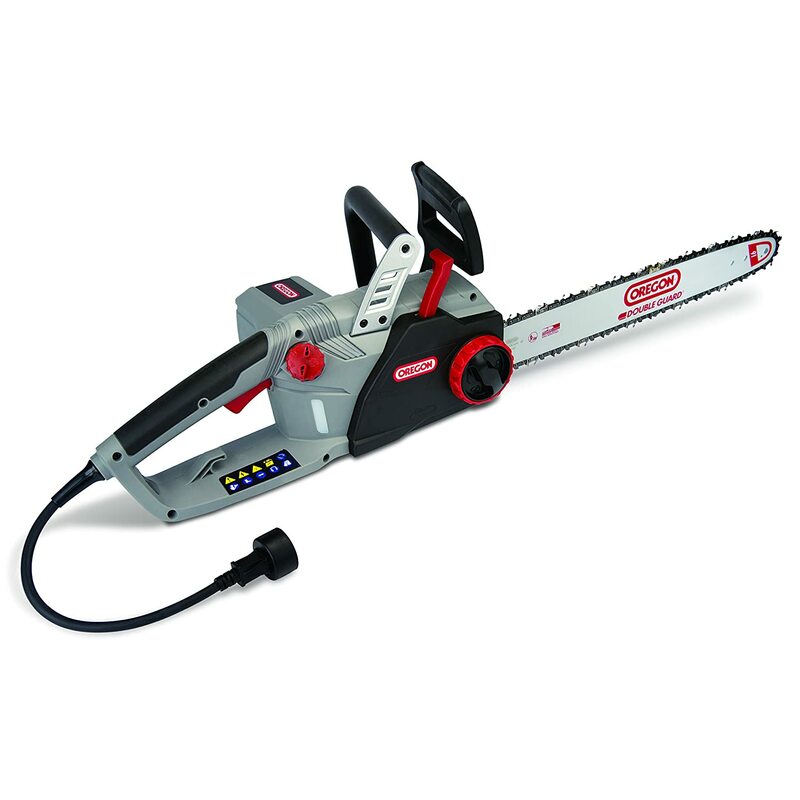 Electric chainsaws are also lighter and easier to handle that gas models. All this translates into less fatigue while trimming and longer motor life. And yes, today’s electric chainsaws have plenty of torque and speed to get the job done. One important note. Since electric chainsaws draw their power through an electric cord, be sure to use a heavy-duty extension cord rated for 15 amps. Light-duty extension cords cannot deliver full power over long distances. Always use a grounded extension cord. Never remove the ground prong on the saw or the extension cord! Best Electric chainsaws typically come in “bar lengths” of 12-18 inches. Bar length indicates the length of the bar upon which the cutting chain rotates. Chainsaws with shorter bars are lighter and easier to control. They are also easier to maneuver in tight cutting angles, which make them idea for tree trimming. Longer bars help extend your reach a little and help when cutting wide branches and thicker limbs, stumps, etc. If you are planning on cutting trees into firewood, a longer bar may prove helpful. You’ll also need to keep an eye on the chain oil level. The spinning blade rests in a groove in the bar. The bar and chain need to be oiled to insure smooth operation. Chainsaws have an oil reservoir that needs to be topped off periodically. Look for automatic oiling, instead of a manual push-button oiling system. An important safety feature is an automatic kickback device. All chainsaws, especially high-powered gas models are subject to kickback. This can happen when the spinning blade at the tip of the bar contacts wood and forces the chainsaw to kick back and upward toward you. Remember! All cutting should be done with the bottom of the bar. The cutting chain on the bottom of the bar, moving back toward the motor, tends to pull the chainsaw down and into the wood. Cutting with the bar tip or slipping and shoving the tip into wood can cause the saw to bounce up toward you. Some better electric chainsaws come with an automatic chain brake or anti-kickback device, to stop the chain from spinning when kickback occurs. Don’t get too concerned with power ratings as they tend to range only between 12 and 14.5 amps. That range will not make a big difference in real-world wood cutting. Overall electric chainsaws with longer bars tend to use slightly larger motors, which can draw a few more amps. Check out our review of cordless hedge trimmers here.